a race that has a different belief on how the soul/magic connect works than most of the world could be interesting. I think that should be done at a faction/country/area level and not at a race level. How about a slave race. They would be known as the Soulless. All other races would believe they are beings without souls. I'm kind of stealing the idea a bit from The Way of Kings by Brandon Sanderson. A race of intelligent yet complacent beings would allow for interesting role play scenarios. I have the same opinion as the race mentioned by OP. It is a nice idea, but it works better as a condition for a character of any race. OP, I also don't see insectoids fitting in this setting. But we know so little, so who knows. 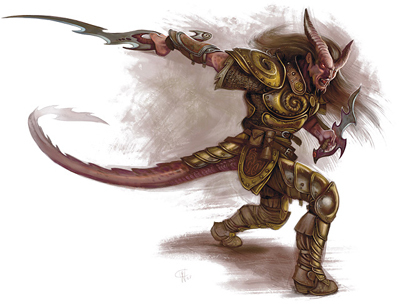 If we don't get the tiefling, I'm all up for a minotaur and a reptilian race. can't we have total non-human races resembling tanarri, baatezu, thokola etc.? never seen that before. If we have tieflings as the godly race, would you still like to have one of those? Or do you see that ground as covered? Well, they said the 5th one would be for "the truly odd". I would have really enjoyed to have orcs or ogres as a playable. So it's a shame they won't be there. Alternatively I'd like to see a matriarchal race, with a culture similar to the drow (if we will have drow, then not so similar but still matriarchal). From a biological point of view, most of these tend to be from the invertebrate family. So maybe we'll get an insectoid race. Maybe a spider alike race? Edited by hideo kuze, 23 September 2012 - 06:10 PM. I am almost positive there will be a faction or country that has different beliefs, but I think it would be cool if the PC could be one of them. Though that could be an option other than race when creating the character. Sadly, that would probably change the story pretty dramatically and end up being too much extra work to be worth it. All I can ask for is no fricking halflings ... I'm not sure I can handle any more of that. And gnomes. Don't forget to hate gnomes. I've had an unreasoning dislike of gnomes ever since Jan Jansen. Death to gnomes in all universes!!! I like the idea of centaurs. They are a classic, yet somewhat underutilised in various settings. Of course, the misogynist in my would rather see a female only dryads race, that abducts human males for procreation, even if all they leave behind is shriveled husks that serves as fertiliser for the forest (it's a "fantasy" setting, right?). Never mind their physical looks and attributes, but I like the idea of "hive minds", where ruling castes control the "drones" with pheromones and other subtle signals. Could look like squid for all I care. Maybe something along a similar vein of Cranium Rats from PS:T, the more there are, the smarter the group is? It's funny, I was against the idea of an insectoid race because I was thinking of something like the Thri-kreen, but a playable, Drider-like race would be pretty cool (which would technically be arachnoid, so I guess I'm not a total hypocrite for liking the idea). Given the emphasis on creating a variety of cultures for each race, the devs would be able to come up with a bunch of interesting societies for these spider-people to have formed. Oh, sorry; I though this was the slavery thread. On a serious note all I really want for races is for Obsidian to stay away from the usual clichés. If I had my way there wouldn't be an elf or a dwarf as far as the eye could see, but since they seem to be "in" already all I can hope for is that the elves won't be aloof archers that live the the woods and that the dwarves wont be drunk Scotsmen with big beards. 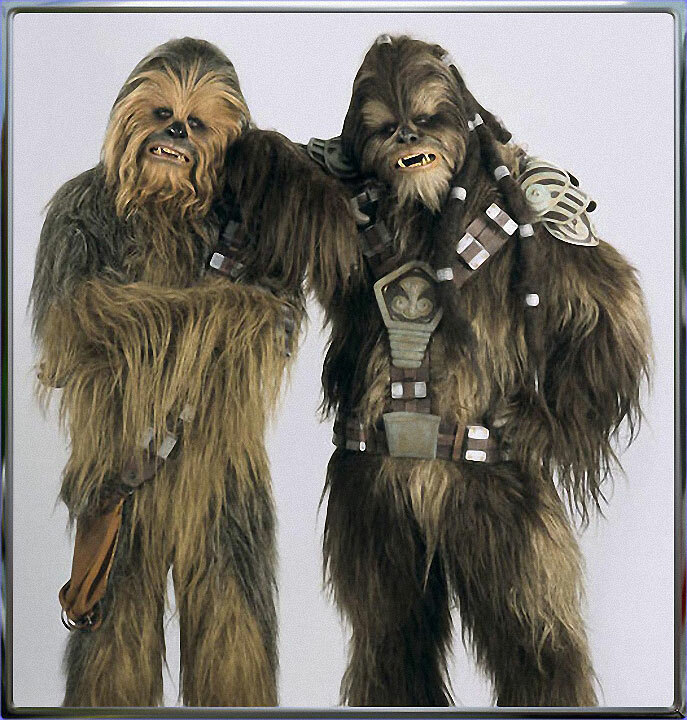 Also, races whose defining characteristic is that they are an anthropomorphic animals are all terrible. I also think that your choice of race should matter in the game. Picking "Elf" during character creation should mean more than just being a human with pointy ears and a slightly higher dexterity. EDIT: Idea for a race I'd like to see: Changeling! Edited by TheMufflon, 23 September 2012 - 06:32 PM. Reading Changeling reminded me of Doppleganger...even though they aren't at all similar. I could see a Doppleganger or a Shapechanger on a minor scale (think Mystique, I would throw in another example but it would be a spoiler) being interesting. But I don't think implementation in a rewarding fashion would be realistic- that is to say having people and the world react to your different changes in a meaningful way. The best one could probably do is add a slight stealth bonus and probably a one off comment or so. Modron-likes! But they're probably hard to do, unless there's a God of Pedantry somewhere making them as his race or something. Insects that go through different stages in their lives, and their personalities change as they do? We've seen a lot of ants and bees, but how about dragonflies? Solitary predators that fly. Intelligent and sentient. Shrewd and cunning. Builds no home. They'll eat anything outside walls, but once in a while they come down to cities to discuss philosophy because flying and eating all the time is boring. They're existentialists, even. The guy discussing the beauty of the world in the bar with you might just apologize nicely and try to eat your entrails when you meet him again outside because hey, it's food, it's not personal? I'd love to see what Obsidian means by races that are truly alien, though. I don't think they lack imagination in this regard. We could even have races of constructs, or the undead, or fairies. I'm not sure about fairies... But I like the idea of constructs and even undead. I'm just not sure if it would work. What good RPGs have implemented these as playable races? but what exactly is an undead race anyway? Edited by hideo kuze, 23 September 2012 - 06:57 PM. I've always been a fan of trans-kobolds. Only if I get Gyrognome. A race that, although once alive like any regular joe, has accidentally undead'd themselves through an accidental magic experiment/explosion/THING on a genocidal scale? As a result, they're all centuries-old and decaying with a sentient mind screaming inside their heads, unable to die but unable to live, there are no children, no hope, and not even antidepressants work because no functional biological systems? Everyone thinks they're gigantic downers and oh god they smell, but they're invaluable as advisors due to having The Long View? tl;dr, a whole race of undescribed sentients that accidentally turned themselves into liches? Yeah, I've been thinking about the possibility of a construct race, too. I know Eberron has a construct race called the Warforged, but having never played an Eberron campaign, I don't know much about them. One possibility for such a race would be that they were constructs created in some magocratic nation to serve as laborers. To make them more capable, their creators imbued them with increasing levels of intelligence and animacy. Still, they remained submissive and obedient due to their soulless nature. Then, strangely, souls started being reborn into the bodies of the constructs. The precise reason for this would be a topic of debate amongst scholars and theorists. Did the increased sapience of the constructs make them viable vessels for souls? Did the gods do it as a punishment for the mage's hubris in creating life, a power the gods considered theirs alone? Whatever the case, now that they were imbued with souls many of the constructs developed the willpower and desire to resist their masters and found their own societies. Others chose to remain in their subservient posts, seeing the security offered as preferable to the uncertain future that awaited their brethren who sought to carve out a new place for themselves in a dangerous world. Alternately, it may have been necessary for the mages to give the constructs souls in order to animate their lifeless husks. Anyway, it might be an interesting race to explore. Are they a dying race due to their inability to reproduce? Or have they discovered the method to make new constructs that will be imbued with souls, thereby allowing them to make their own children? If not, do they turn to stealing the souls of members of other races and placing them in new constructs? How would they view biological beings? Do they have societal splits as a result of differing opinions on this issue? How cohesive are their societies? Do they work well together or are they individualistic (or do they not have any predisposition towards either)? Or maybe they would be too much like a machine race from Sci-fi; I don't know. Edited by eimatshya, 23 September 2012 - 08:33 PM. Undead (i prefer if they are ethereal vs zombi like) or Modrons-Constructs have REAL interesting concepts in a game like this cause the firsts lost his souls (if not, they will reincarnate) and the seconds doesn't have one to begin. Pixies! For ****s and giggles! We're at 5 races now but that might be increased depending on what they add to the enahnced kickstarter goals. What doesn't stop to continue to amaze me is that people really think dev team would actually consider their ideas. Really, the amount of threads with people proposing various additions and tweaks is astonishing. Yet I would be surprised if a single idea actually made it to development stage, not to mention the game itself. That said, I'd really, really like snake folk. I'm all about snakes. Nagas, lamias, gorgons, I can't have enough of it. I hope there will be some at least as NPCs or in future games of the franchise. Also, insect race, if done well, might turn out to be very, very good, if their alienness is explored and played for all it's worth. I've seen other threads on Project Eternity's races, but they seem to all be arguments over whether or not to have Elves and Dwarves. So, since it sounds like Project Eternity will have Elves and Dwarves, what would you like the other race or races to be? So far we have Human, Elf, Dwarf, and possibly the Godlike. That's four out of the five playable races. What else would you like to see? They've mentioned the possibility of an insect race; personally, I'm not that interested in having one. I've seen interesting insect races in some pen and paper games (Ashen Stars and Dark Sun), but I'm not sure an insect race really fits a medieval Europe themed setting (assuming that's what we are going to get with P:E). I would like the races to fit the world (although I suppose there could be parts of P:E's world where giant sapient insects would feel more appropriate). I liked all the bizarre races that we had in Planescape, but they seemed appropriate in the setting. I think the bizarre factor needs to be toned down in a more conventional setting (i.e. European inspired fantasy). Anyway, I think it might be interesting for the fifth race to be people who were born with souls that had somehow carried with them traces of their previous incarnations' deaths (maybe only in instances where the deaths were especially traumatic). As such, the soul would taint the new incarnation with an element of death, meaning that, while technically a member of their parent's race, these beings would be part mortal and part undead. This would leave them pale and sickly looking but would give them extended lifespans and heightened immunity to diseases and death magic. Their connection to death would also give them a greater sensitivity to the souls of others. Perhaps they could tell whether the soul was whole, fragmented, awakened, etc. This sensitivity would also make them more aware of the presence of concealed individuals (bonus to perception checks to spot hiding or invisible people) and possibly of ghosts, if they exist in this setting. Due to their cadaverous appearance, they might have penalties to social interaction, especially in societies in which they were stigmatized. I'm not really sure what to call them, the Deathborn? Deathwalkers? I got the idea from the Shade race in Shadowbane, so maybe they could be called that, although that would probably be a copyright violation. I suppose these wouldn't be a "race", so to speak, since their condition wouldn't be hereditary and their offspring, assuming they aren't all sterile, would probably be normal members of their grandparents' race (unless they had the misfortune to be born with a tainted soul, as well). If Obsidian decides to go with something more traditional, I would be interested in playing a member of a stereotypically brutish race like an Orc, Troll, or Minotaur (the Minotaurs in Shadowbane were pretty cool). Anyway, what ideas do you guys have for the fifth race? I think a race of giant beetles would be cool and not out of place for Europe-ish fantasy. Neither would a praying mantis-ish race. I think the issue with insectoid races is mostly that it's hard to make them compelling as characters while keeping them different enough to truly be foreign. It can be done, but the easy thing to do is just make them super-specialized and mostly act like a human. I could see some really weird quests coming out of insects. Something kind of related that might be important is whether souls migrate species/racially. Each one having its benefits and negatives perhaps, and these showing up even at the later stages. Which, IMHO, means that they shouldn't be restricted to +x points to y stat. And since it was already brought up, no pallet swap(though I doubt we will have to worry about it) and perhaps some more "alien" races. While I have faith in the dev team and believe that they can make a masterpiece out of anything, I'm very disappointed with their choice of including elves and dwarfs. Not to mention that it has been done to death decades ago, these 'races' simply aren't distinct enough. Elves are just slender people with pointy years, dwarves are just stocky Norwegians with puffy beards, and even if they would be played differently that still wouldn't change the fact that they're just humans with minor cosmetic changes. Yes, they could be made magical, they could be made long-lived, but the same thing can be done with a group of humans. There just really isn't any sensible reason to take an ethos, give them magical abilities and pointy ears and call them a different species, especially if it comes to the territory when such races can interbreed. If you want magical gypsies, then make magical gypsies instead of breeding entities. What's worse, it could and often does degenerate into planet of hats setup where all members of a race are the same, just according to ethnic stereotypes, like in Dragon Age, when humans have counterparts to various real cultures, but dwarves, elves and especially kossith were all the same when they weren't like humans. It's really like a different race instead of a different species. Now, if they were included as subraces of humanity that would be great, that would be awesome and it'd add diversity without simultaneously taking it away. But as is, it's just sad. What doesn't stop to continue to amaze me is that people really think dev team would actually consider their ideas. Really, the amount of threads with people proposing various additions and tweaks is astonishing. Phraint—amoral, logical grasshopper/mantis humanoids who were noted for their acrobatic, leaping attacks where they would throw a javelin at the apogee of their jump, flip over their opponent, and strike from behind with a two handed sword. Deodanth—loosely based on Jack Vance's Deodands, these were interstellar refugee, matriarchal, vampiric catlike elves. Kobbit—half kobold, half hobbit. They were good with slings, and somehow figured out a way to poison sling bullets. Lore: why Aumaua are not dominating the world yet?